With Shazam! now in theaters, Warner Bros. has promotions galore coinciding with the film. This includes adding Billy Batson and company to its latest comic book video game, Lego DC Super-Villains. Warner Bros. Interactive Entertainment announced the first of two downloadable content packs for the game, with the first available now on all platforms. 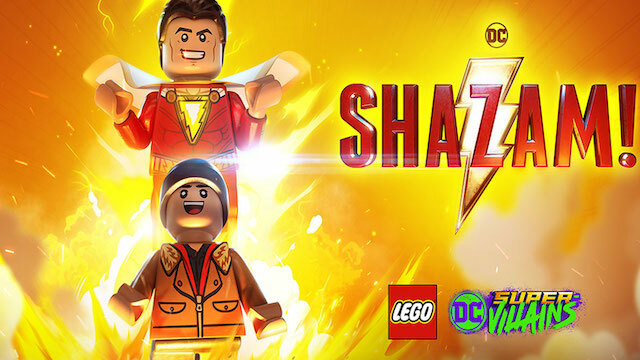 Players can take control of Billy and Shazam!, as well as various other characters from the movie. You can see the first trailer below. In it, star Zachary Levi explains just how cool Lego Shazam really is. In the Shazam! Movie Level Pack 1, players will have the chance to battle against the powerful Dr. Sivana. Players can also switch between Billy and Shazam with the press of a button. Freddy Freeman, Billy’s best friend, is also playable, with a surprise of his very own. A second Shazam! DLC pack will release on April 23. Though it hasn’t been detailed just yet, it should introduce even more playable characters from the film. Perhaps we’ll even get hands-on with the original Shazam, portrayed by Djimon Hounsou in the movie. The Shazam! packs are priced at $5.99 each. Players can also pick up the Season Pass for $14.99. It includes other DC-themed packs, including ones based on Aquaman and Batman: The Animated Series. Lego DC Super-Villains is available now for Xbox One, PlayStation 4, Nintendo Switch and PC. Are you eager to play the new Shazam! DLC? Let us know in the comments below!